This is awesome. The clouds, the rocks, all the close traffic headed downhill...and that tree (or bush) in the foreground, witnessing it all. 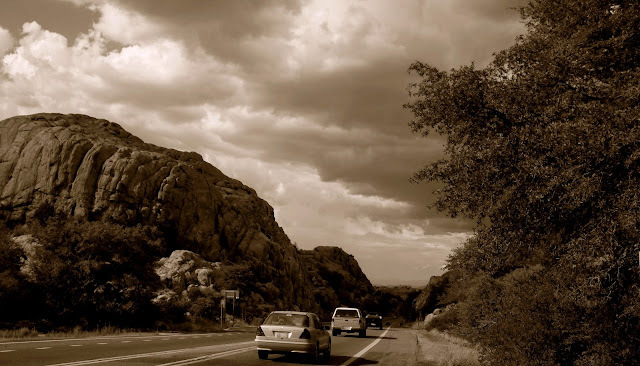 I love the sepia tone in this photo, the wide open space of sky engorged with clouds, the framing of the sky on either side with hill and tree and the cars heading down the highway to some new adventure. It is a picture out of time. It could be any time really. Well done. My good friend rebecca lives in Prescott. I have family in the southwest, Santa Fe. the terrain is familiar.